In honor of National Poetry Month, we are pleased to announce that one of our island poets has a new book out. Peter was the brother of Nancy Berges, Michael Kilgore, and Mervin Kilgore, and father of Shawnee Kilgore, who sometimes delights Long Islanders with her musical gifts. This book will be available at the Long Island Community Library. Peter Kilgore; Bruce Holsapple and Dana Wilde, eds. Peter Kilgore (1940-1992) was a well-known figure in Portland, Maine’s literary underground in the 1970s and ’80s. His taut, crisply imagistic poetry of the Maine coast and wilderness areas appeared during his lifetime in many regional publications and in several books and chapbooks, including The Bar Harbor Suite (Blackberry Books) and Drinking Wine Out of the Wind. All of Peter’s published poems and many he left in manuscript are offered for the first time together in Quarry. A graduate of Bowdoin College, Peter was a founder of the Maine Writers and Publishers Alliance, a teacher, and a contributing editor for Contraband, one of Maine’s most influential small magazines. His poetry reflects a deep reverence for Maine’s natural world, particularly his relationship to the sea and Casco Bay. 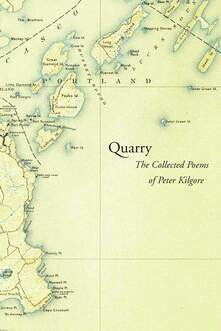 His poems are likely to register profoundly for a long time to come, and Quarry secures Peter’s place in the literary history of Portland, and Maine.